← Amazing – Wine Tasting on Mount Everest! There are many reasons we don’t care for this question. First of all, my “favorite” wine is usually the one I am with. Second, it changes all the time! Third, I really don’t want to offend anyone –and you never know who is listening! Finally, people usually only ask you that question because they want to tell you about their favorite wine, which is sometimes just painful to listen to…. Ok, thanks for listening to my rant. While I stand by the idea that “what’s your favorite wine” is a question wine professionals would rather not answer, over the years I have developed a pat answer that, while getting me out of many a squirmish situation, is also based in truth. My standard answer to the question is: The Chocolate Block, a South African red blend produced by the Boekenhoutskloof Winery in Franschoek. Now, I will admit that my uncanny (and much-rehearsed) ability to pronounce “Boekenhoutskloof” may be part of the package, however, this is also an amazing wine, delicious and seductive, and like all good things…it comes with a great story. The wine itself has a great story attached to it, which you can read on the Boekenhoutskloof Website. Suffice it to say the wine “has secrets to keep” and “inspired a graphic novel.” But as this wine is my personal favorite, you know there is a personal side to the story of the wine. 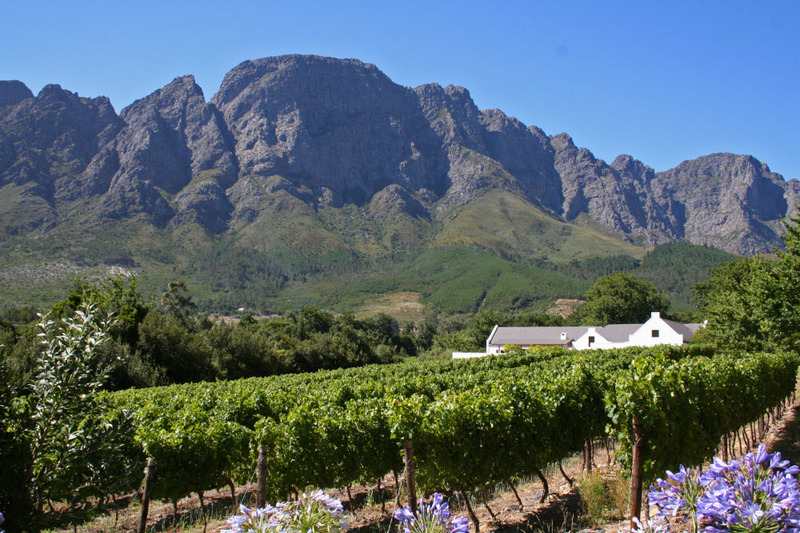 It’s actually quite simple: a few years ago, I was on an amazing, WOSA-sponsored trip through the wine producing regions of South Africa, having won a wine-related essay contest. One morning towards the end of our trip, our driver dropped me and my best friend/travel buddy off at the Boekenhoutskloof Winery in Franschoek for a tour and tasting. Our host was smart enough to just let us zone out for a while…he was surely used to such things. When the conversation started up again, he told us a bit about the scenery. We were located on the edge of a vineyard, just a few hundred yards away from a stream. The stream was lined with Coast Silver Oak trees – a tree native to South Africa, we learned. My friend saw a group of people riding horses along the stream, sauntering under the beautiful trees, dreaming of African skies, and our host told us that horseback riding was an easy activity to sign up for. Perhaps we would like to ride some horses that afternoon? We were about to say yes, but before we could, he told us a “humorous” story of how, just the week prior, a group of tourists had been riding by – just like the group we had seen, when a nest of Cape Cobras had fallen down out of the trees, onto the tourists, wrapped themselves around the riders, and spooked the horses. Cape Cobras? There is such a thing as Cape Cobras? Turns out there is such a thing as Cape Cobras, and before anyone works the vineyard in the morning, they send brave people running down the rows of vines, banging pots and kettles together to make a joyful noise and send the cobras scurrying off. Ok. We feel better now. So that’s my personal Chocolate Block story. But the wine itself, based on a varying blend of Syrah, Cabernet Sauvignon, Grenache, Cinsault, and Viognier, is delicious. It’s the wine I invented the tasting phrase “slips down your throat like the good Lord himself in velvet trousers” for. You can seek and find aromas and flavors of cherry, blackberry, cocoa (of course), coriander, cedar, red currant, marzipan, black plum, and raisin. The wine currently sells for about $22.00 in Texas. ‘…the good lord in velvet trousers’ and the evil snakes make it biblical, but it sounds like the wine itself made it a religious experience. Your writing is delicious. Thanks, Miss Jane. I’ll be looking for the chocolate block. Thanks for the note!! I never thought of the Biblical angle, but the story of the snakes truly fits the bill! Thank goodness we never had to see one! 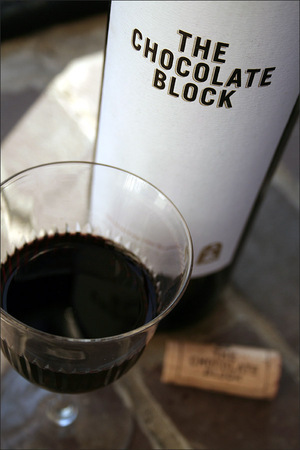 You will love The Chocolate Block – it is an amazing wine! It’s amazing to see the South African legacy is caught up to you in Texas! 🙂 enjoy and have fun!! Hi Joanna!! Texas loves South African wines! Have a great day!! Love this post and thank you for your invaluable help with wine knowledge!